Throughout my childhood, Mom drove my brother and me across town to the pool at least three or four afternoons every week during the summer. We loved diving for plastic pool rings and practicing our “fancy jumps” into the water… And Mom loved how we expended so much energy and fell asleep much faster those nights! Every hour, the lifeguards blew their whistles to signal the start of Adult Swim. We climbed out of the pool, sat down on our beach towels, and impatiently watched the clock for 15 minutes while Mom swam laps. Although the parents truly appreciated the uninterrupted time to get some exercise, we couldn’t wait to hop back in the water! Mom always made sure to bring lots of water, juice boxes, and snacks for us during those Adult Swim breaks. We usually found Ritz crackers and a jar of peanut butter in her beach bag, but we occasionally came across a box of graham crackers… And on really special occasions, she surprised us with chocolate graham crackers! 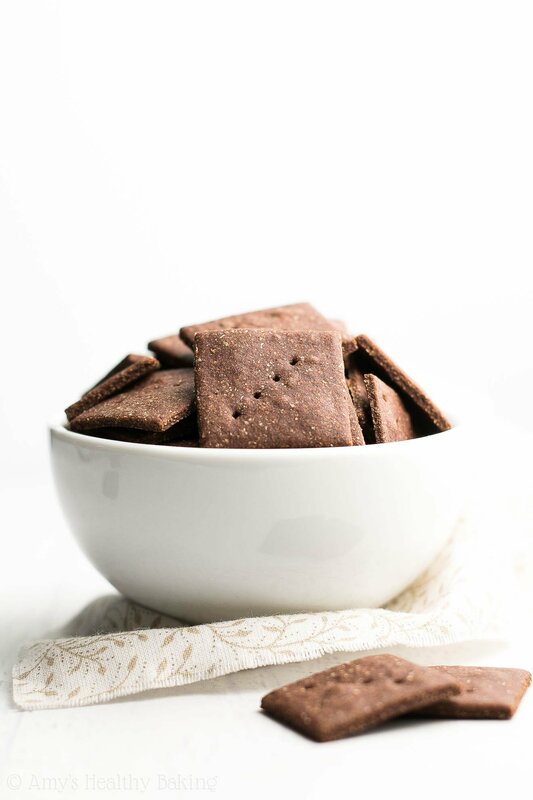 Whenever I bake these Healthy Mini Chocolate Graham Crackers, I think about those extra special pool days from my childhood. They’re just as chocolaty and crunchy, but this healthy homemade version contains no eggs, butter, refined flour or sugar! You can watch my episode below where I show you how to make these healthy homemade graham crackers, and you can get my recipe directly beneath the video. And remember to subscribe to my TV show here, so you’ll be the first to know when a new episode airs each week! 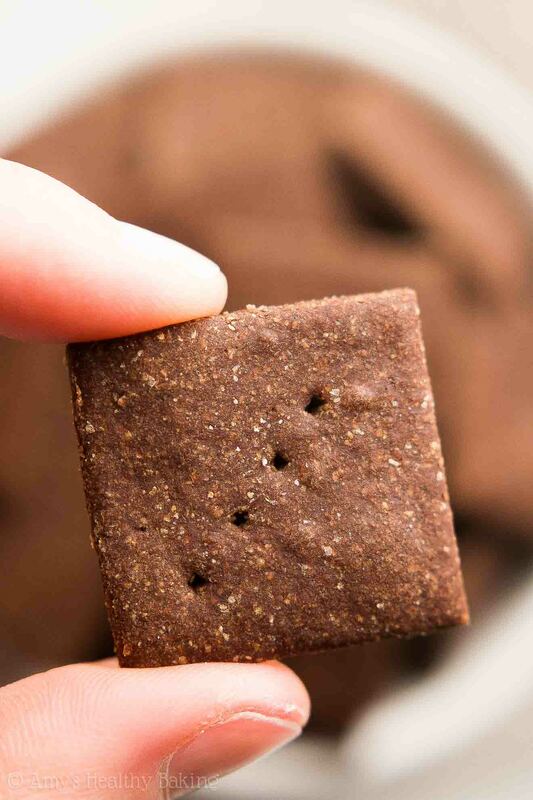 You can find my Healthy Mini Chocolate Graham Crackers recipe HERE! So far have tried the Peach Pancakes, Peanut Butter & Banana Bread, all are fabulousssssssly ? Today it’s the Mini Chocolate Graham Crackers, thank goodness my girlfriend loves her new kitchen. ? PS Looking forward to all of your recipes. YES! Graham crackers were always a childhood favorite; and I liked the chocolate Teddy Grahams too, if those count 😉 Love the history lesson on graham crackers and the important tip about the silicone roller. Another great recipe and step-by-step episode, as always. I just adore your stories!! Is it just me, or is 15 minutes for adult swim really short!? I’m sure a child it felt like light-years for you guys, but having those treats surely helped!! These look so good, per usual, and much better for you! I always keep searching for healthy recipes, and Amy, your recipes are the best. I tried the ‘Mini Chocolate Graham Crackers with whole wheat flour, as I didn’t have white whole wheat flour. They turned out fabulously crispy and tasty. Thank you very much for the recipe. I’m so glad you loved these homemade graham crackers Bhavya! Thanks for taking the time to let me know! 🙂 I can’t wait to hear what recipe you decide to try next!